U.S. Army Signal Corps General Henry H. C. Dunwoody received a patent for the carborundum crystal detector in 1906. This work paved the way for later crystal detector inventions. This fine crystal set kit was named after General Dunwoody for his contribution to the science of radio and electronics. The circuit is based on a very selective and sensitive design that has been used since the very early wireless days. It employs an antenna/ground tuning capacitor to fine tune the input to the parallel tank tuning circuit for optimum selectivity and signal level. The air variable capacitor tuned parallel tank circuit is then adjusted to resonate at the desired frequency. The combination of these two air variable capacitor tuned circuits makes this set perform far and away better than regular single-tuned, or slider-tuned crystal sets. The air variable capacitors are the same fine American-made units that we use on our Armstrong One Tube Radio Kits. This kit is based on our ELECTRONICS HANDBOOK Magazine article, "Build A High Performance Crystal Set", reprints of which are available in our "Literature" Link. This is an improved version of that radio. 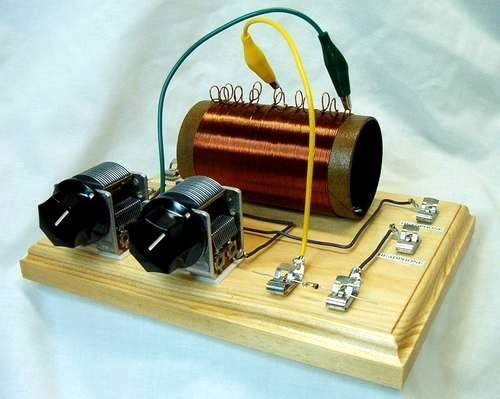 The tapped coil circuit allows selection of frequencies from below the bottom of the A.M. Broadcast Band all the way up to about 12 MHZ in the Short Wave bands. It is common to be able to hear real DX from short wave broadcast stations thousands of miles away when conditions are right. It is a real thrill to hear the BBC London, Radio Netherlands, Radio Taiwan, and others on a CRYSTAL SET! The performance on the AM Broadcast Band is also exceptional. It is possible to hear AM stations hundreds of miles away when conditions are good. One inovation in this circuit is the Detector Tap Cliplead. This feature allow you to select the point on the coil where the signal level is highest for the crystal detector. This point varies with the frequency to which the set is tuned. Most crystal sets have a fixed detector connection that does not allow for this performance enhancing feature. Highest quality parts are used throughout. The pre-drilled routed base board is made for us by TOLEWOOD.COM from clear furniture grade pine that can be stained for an attractive vintage look. The pre-punched coil form is made from heavy cardboard shipping tubing like our other sets. Quality black bakelite tuning knobs contribute to the vintage appearance. The 1N34A Germanium crystal detector is hand selected and tested for greatest sensitivity. The use of Detector Fahnestock clips allows the use of external detector stands. Enough room has been designed into the detector area to allow installation of a detector stand on the board in place of the germanium diode, if so desired. We sell vintage detector stands in our "Detectors" Link on this web site. Nickel plated brass fahnestock clips are used for all connections. All parts, screws, washers, sandpaper, and wire are included in this fine quality kit. The easy-to-understand instructions were designed for beginners, however the coil winding is at a level of difficulty for adults or more experienced young builders. Soldering is required. This set requires a high impedance magnetic headset or ceramic earphone available on the "Headsets, Earphones...." link on this website. This radio also performs exceptionally well with the Radio Shack Speaker Amplifier we sell for $14.99. The Radio Shack Speaker Amplifier requires an adapter cable we sell for $4.95. An outside antenna is necessary for optimum performance. An outside antenna kit is available from us for $19.95.